Today, I wanted to check out my account balances, to see if my payment for my Rogers Wireless account went through. To check my account, I quickly use the Rogers Wireless My Account app I recently reviewed. It’s faster than using my BlackBerry browser and less frustrating than waiting in the phone support queue. Before I was able to check out my balance, I was greeted with an update notification. Version 1.0.1 (previously 1.0.0.76) brings more options to the table. A new tab, labeled “services” is not available. 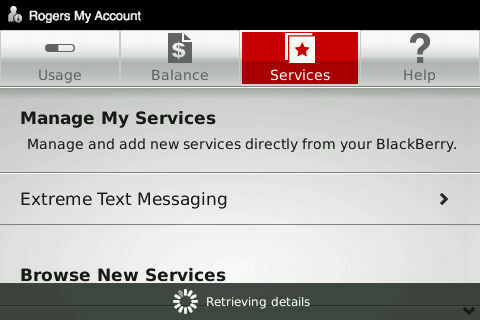 Rogers wireless customers now have the option to add and manage services straight from your BlackBerry. I would assume that this menu would be different for each customer. If you want to make use of the application, access the icon on your home screen or download it from the Rogers My Account page in your bookmarks.